Miss me fellow football fiends? It seems a cruel twist of fate that football season AND my beloved laptop should both meet such uncermonious ends at the same time, eh? I fried my motherboard and the team at Best Buy is fixing it. Thank God for warranties. My Superbowl Pick? The Pats. I hope to find some computer time before Sunday to tell you why. Greetings Football Fans and devoted followers of the Gridiron Goddess! My name is Jimi_Thing, a close friend of our hostess. GG’s laptop suffered a devastating late hit (resulting in an unsportsmanlike conduct penalty, complete with loss of down) that is keeping her from suiting up for the expected high-quality pre-Super Bowl analysis we all would have come to expect this week. Send good karma to her lap top! So … GG asked me to drop in to provide a little air cover. Full disclosure here sports fans – I am NOT an objective, impartial football analyst. I am a full-fledged, dyed-in-the-wool, jersey-wearing Patriot fanatic. Have been for over 30 years. I know that many of you out there hate us, and for that I’m sorry. GG also plans to invite a Giants fan or two to return the favor, so expect ‘equal time.’ For now, here is today’s helping of Patriot adulation. 10) The Patriots Defense – the ‘Bend but don’t Break’ boys are aging but still strong, smart and tough. You’d be amazed at the number of jerseys you see around town with the names Harrison, Bruschi and Vrabel. Count on it – Rodney and Assante will find a way to pick off at least 2 Eli passes, and the pass rush will force at least one fumble. Junior Seau will be a man possessed. 8 ) The Patriots Receivers – we should rename them with one long hyphenated name: Moss-Welker-Gaffney-Stallworth-Watson. Brady wanted some quality receivers – he got his wish. Moss is as dangerous when he attracts double coverage and DOESN’T get the call as when he makes those ridiculous catches. 7) The Patriots new found running game – Lawrence Maroney has emerged as a defense buster, and Kevin Faulk is the best third-down guy in the league. 6) The Patriots Game-planning – is there any doubt that the Pats will be ready with several schemes to address the shortcomings of Game 16 and exploit some little-noticed Giant weakness? 5) The Patriots ownership – Mr. and Mrs. Kraft are what I’d like to think we’d all be if we had tons of money. They are wonderful people. 4) The Patriots Coach – If you’re looking for a party date, you may want to look elsewhere. But if you want to coach an NFL football team, who would you take over Coach Hoodie? How many teams come looking to hire his assistants as Head Coaches, and yet somehow he keeps grooming new winners. 3) The Patriots Quarterback – What can you say that hasn’t already been said? Brady is a first-ballot Hall of Famer who just had the year of his career. When you die, don’t you want to come back as Tom Brady? 2) The Patriots Spirit and Ethos – Team First. Ask Adalius Thomas what he learned when he came here from the Ravens. In Baltimore, everyone wanted the limelight, including the Coach. Here? Not so much. 1) That a sports franchise can make a population of people feel so blessed. These are truly the best of times in Boston Sports. Happy Watching all, and Go Pats! Greetings, readers. I am delurking for a second to let you know that the Goddess’ laptop is in for unscheduled maintenance. She will return as soon as possible..
What confuses me is, Norm Chow was approached about the Head Coach position at UCLA before Neuheisel was and he declined. Sure I know he was still employed with the Titans at that point, but now instead of head coach he is a collegiate offensive coordinator, AGAIN? I say it again, why Norm why? I could not have said it better! Props to my friends at Trojan Wire for Chicken Chow-Lame! Let the hate (by the Trojan Nation/Mafia) commence! Chow to UCLA: Say it ain’t so Norm! 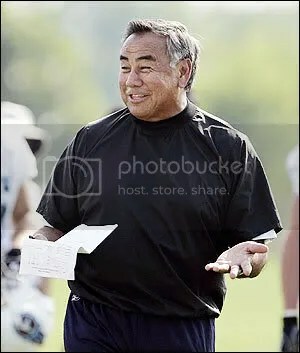 Reports this morning are that former USC and Tennessee Titans offensive guru Norm Chow is defecting to the Evil Empire known as UCLA. Seriously Norm, why? 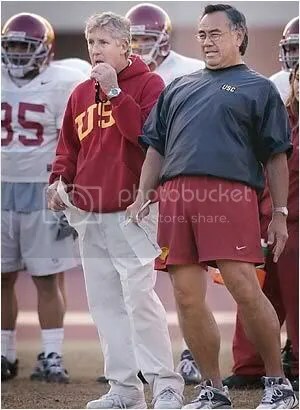 Did Jack Del Rio, himself a USC Alum, offend you that much? Are you ready for some FOOTBALL?! Are you ready for the AFC and NFC Championship games my fellow football fiends?! It is cold and windy in New England. Phillip Rivers has ACL and MCL issues. LT is a force to be reckoned with but the force that CAN reckon with him is the New England Defense. It is -12 with the wind chill in Green Bay. And Elisha is a fumbling-interception throwing machine in the frigid cold. Well I’ll let you all get back to your nacho making and beer runs before the game starts!!!! You are currently browsing the Gridiron Goddess blog archives for January, 2008. Get great sports tickets at Razorgator! We have the best NFL tickets, Dallas Cowboys tickets and Super Bowl tickets. Make SportsBettingWorld.com your destination for all your NFL betting needs. They offer the latest odds/lines on every football game. Choose Vividseats.com for all your NCAA Football Tickets and NFL Football Tickets needs! We buy and sell tickets for all games including Carolina Panthers Tickets , New York Giants Tickets and Dallas Cowboys Tickets! CFB Week 5 and NFL Week 4 Picks!